In 2013, Annette Abolins, an Australian artist (www.abolinaart.com.au), self published a very colourful tarot. The title refers to the nine lives of cats which appear on some cards and it is related here with the depiction of life's cyclic movement. Cups, pentacles, rods and swords represent respectively the emotional, wealth, spiritual and mind journeys. In 2015, she published a pack of 54 cards (Bridge size) inspired by the artwork from the Nine Lives Tarot. The illustrations incorporate the Kings, Queens and Knights dressed to match their corresponding playing card suit. 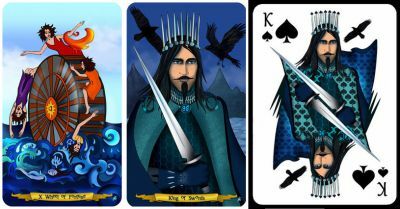 Later this year, a second pack of 54 cards (Poker size) will be published with some modifications like Jack (J) instead of Knight (Kn) and borders have been removed from the court cards to make use of the wider canvas. Price and where to find: The tarot is sold for AUD 37. The bridge pack is sold for AUD 17.